This past March Break our family was back in Cuba. It was our fourth visit to the Cameleon resort in Jibicoa - along the coast some 45 minutes east of Havana. We had done many of the organized day-trips from Jibicoa on previous occasions, some of them two or three times. What I particular hoped to do on this visit was to go back to Finca Vigia (Lookout Farm), the former home of Ernest Hemingway (1940-1961). The Hemingways bequeathed it to the Cuban government, with the understanding that it would be turned into a museum devoted to the famous and influential writer, who was also revered on the Caribbean island that had become his home for the last two decades of his life. I had been to the museum back in 2010, during our first trip to Cuba, but that turned out to be a rather rushed visit. The rest of my family had no interest - the children had no knowledge of the author, and my wife is hostile to the man. I got to see the house and, by leaning in through the doors and windows, I was able to get some excellent views of most of the rooms in the ranch-styled dwelling. Here is a link to the blog post I wrote in February, 2012 which documents that original trip. Because of the rush imposed by the rest of my family back in 2010, I didn't get the chance to wander around the property. And it upset me to discover later that Hemingway's pool and, more importantly, his fishing boat Pilar was but 100 yards from the house - and I missed it. The desire to see the boat, perched on concrete blocks beneath a carport-styled protective roof, became even stronger after reading Hemingway's Boat a couple of years ago. 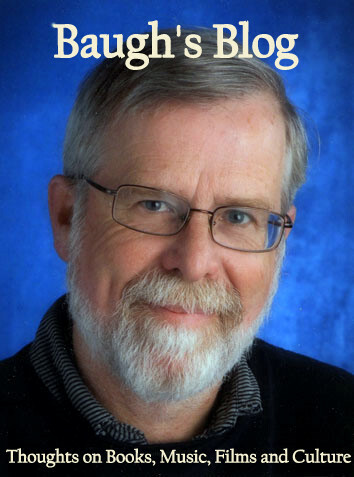 This excellent book, by Paul Hendrickson, was published in 2012. 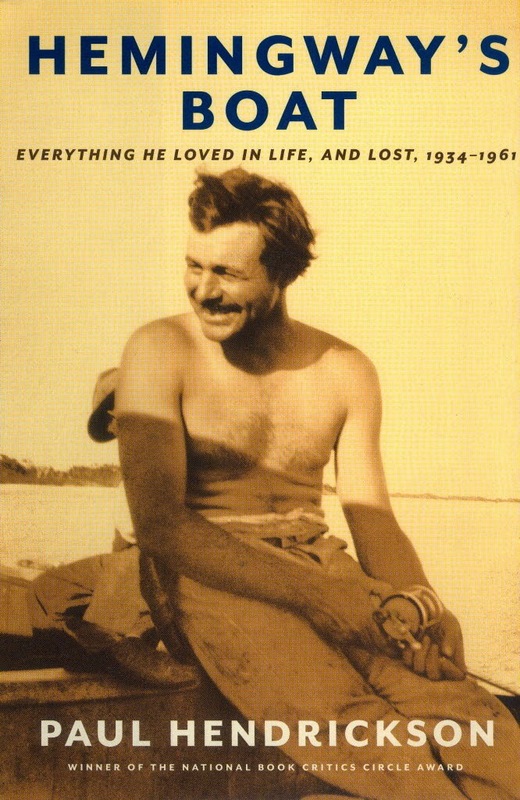 It tells the story of Hemingway's life by focusing on his love of fishing and providing a full account of the boat he bought in the mid-30s, and the adventures he got up to plying the waters of the Gulf Stream ("the great blue river"), just off the northern coast of Cuba. I had to get back to Finca Vigia to see Pilar up close. But I knew the rest of my family would not be interested in joining me. This would be a solitary pilgrimage - or so I thought. A day or two into our stay at Jibicoa, I was waiting patiently to talk to the Nolitours representative, Roberto, about options for getting to Finca Vigia by myself. I was thinking of taking an official taxi (parked just outside the resort), or of finding a freelance driver to do the job - perhaps the same guy who had taken us to Havana in 2013. As I was waiting, I overheard the couple sitting at Roberto's desk ask him about the chance to visit the Hemingway Museum. Not shy in this sort of situation, I jumped in to explain that I, too, was a keen fan of the author and wanted to get to his former home. Within an hour all the plans were made. My brand new 'Hemingway friends', Richard and Brenda, had agreed to split costs and collaborate on a visit to Finca Vigia, on the outskirts of Havana - plus a trip as well to the village of Cojimar, where Hemingway often docked his boat. Cojimar is the model for the fishing village described in The Old Man and The Sea. 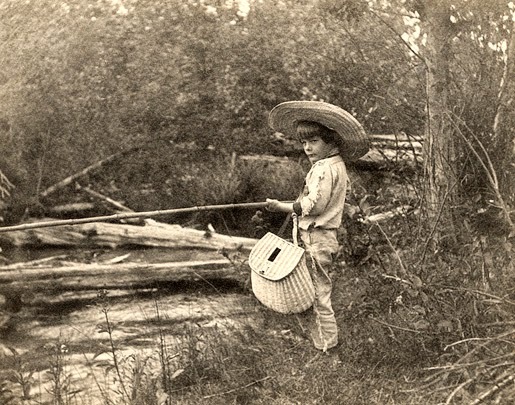 Ernest Hemingway learned his love of the outdoors from his father, who introduced him to hunting and fishing during their annual summer vacations at their cottage on Walloon Lake in Upper Michigan. Hemingway was fishing every summer until his early twenties, when he and his wife moved to Paris. 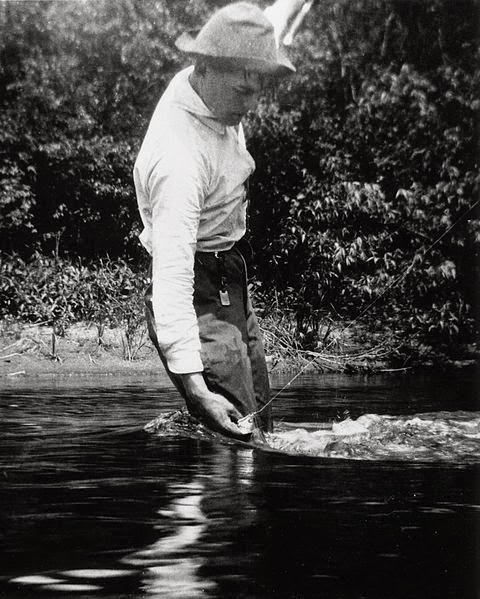 During his European years (most of the 1920s) he did only a bit of fishing, but it wasn't until he moved to Key West, Florida, in the early 30s, that his interest in fishing switched from freshwater fishing in lakes and rivers to deep-sea ocean fishing from a fully-equipped cabin cruiser. 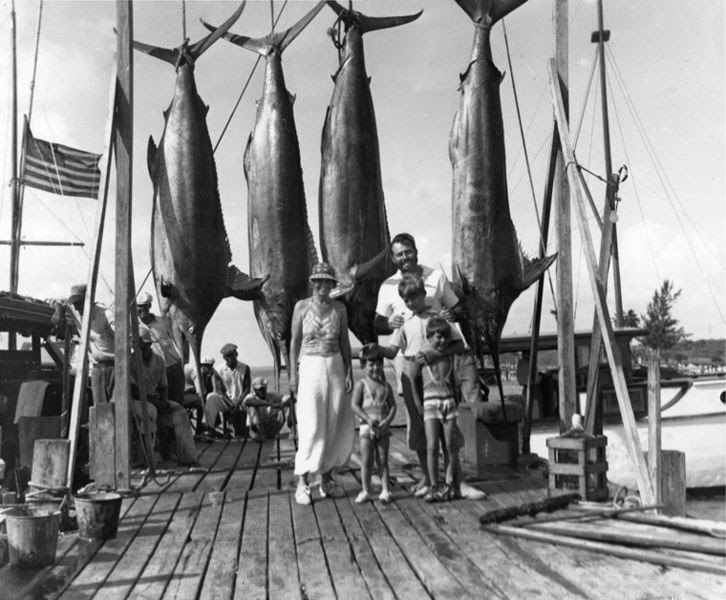 There were two friends of Hemingway's in Key West who got him hooked on deep-sea fishing. One was Charles Thompson, the owner of a hardware store. Hemingway had known him since his first visit to Key West in 1928. 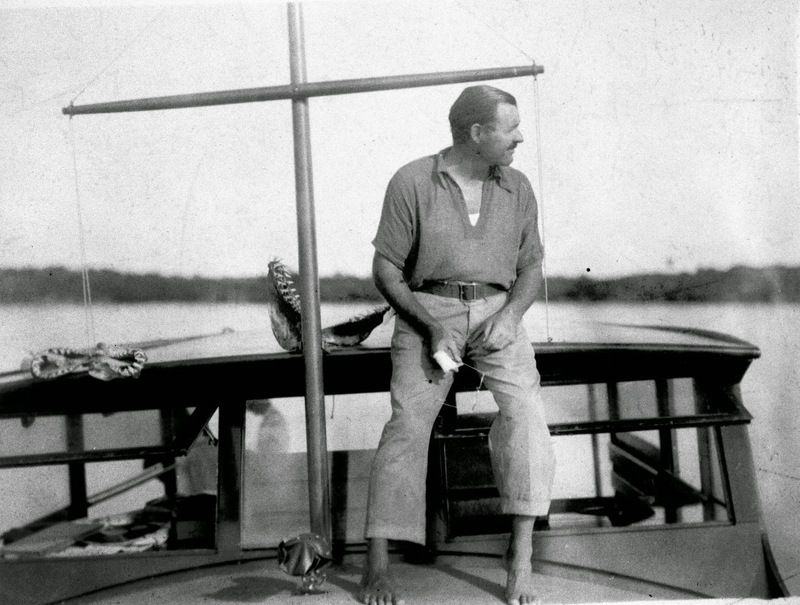 Thompson had an old-fashioned 19' boat; he took Hemingway out fishing in it on day-trips. Later, when Ernest settled in the town, he met Joe Russell, who ran a bar there called Sloppy Joe's. He had reputedly been a long-time "rum-runner" from Cuba. He used to sell rum to Hemingway in the early 30s - the final years of America's Prohibition era. Russell had an impressive 34' cabin cruiser called Anita. It was from this boat that he introduced Hemingway to marlin fishing. 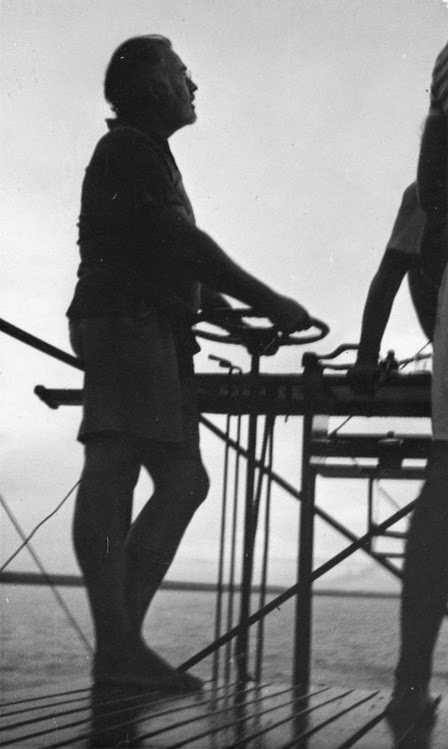 In April 1932 Russell took Charles Thompson, Hemingway, Hemingway's cousin Bud White, and a couple of others out on a fishing trip - over towards Cuba. The original plan was for a relaxing two weeks of fishing. But it turned into a two-month extended marathon of fishing focused exclusively on marlin. 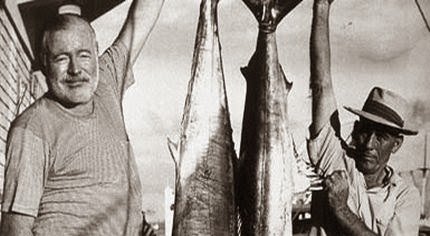 Hemingway became obsessed with the hunt for these huge and majestic fish. In his first couple of years of serious Marlin fishing, he caught 91 of them. When Ernest and Pauline Hemingway did a two-month safari in East Africa in January and February of 1934, they were accompanied by Key West friend Charles Thompson. He and Hemingway must have spent a good deal of time talking about their deep-sea fishing exploits; because when they got back to the U.S. in April, Hemingway had made up his mind to buy his own cabin cruiser. He had done his research, and his heart was set on getting a Wheeler boat. He had previously contacted the Wheeler Shipyard - located in Brooklyn - the previous year; and they had sent him by mail a brochure of their boats from the 1933 model year. In his book Hemingway's Boat, Hendrickson quotes boat historian Anthony Mollica describing Wheeler boats: "A Wheeler is a Packard. A prewar Packard. Big and strong and comfortable and sturdy. Beamy. Sea-kindly. Very well thought out. Extremely well made". The catalogue price for this boat was $7,000. Hemingway had $3,500 to hand. How to pay for it? Hemingway had a scheme in mind. He had met magazine publisher Arnold Gingrich in New York in January, 1933. Since then, Gingrich had been at work planning a new magazine for men called Esquire. He had been lobbying Hemingway to write for his new publication - he was particularly keen to have him featured in the debut issue. Hemingway contacted Gingrich and proposed a deal: if Gingrich gave him an advance of $3,500, he promised to submit regular articles for the magazine, until the debt was paid off. Gingrich agreed. 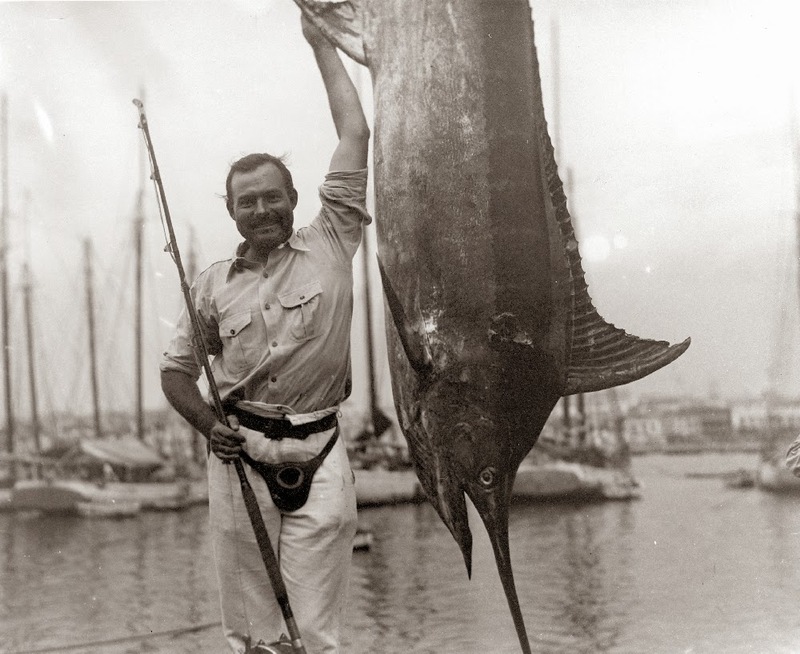 The deal worked to their mutual benefit; Hemingway got his boat, and the first issue of Esquire - which featured a piece by Hemingway about marlin fishing - sold 100,000 copies. Ernest Hemingway visited Wheeler's Shipyard in Brooklyn in early April, 1934. He ordered a 38' twin Playmate cabin cruiser. These were stock boats, but he asked for a number of modifications: he wanted a black hull, instead of the standard white; he also had copper screens added to enclose part of the cockpit. The main power to the boat would be supplied by a 75 horse-power Chrysler Crown reduction gear motor - this would provide a cruising speed of 16 knots. The smaller trolling motor would be a 40 horse-power Lycoming, providing 5 knots. The name to be painted to the rear and sides of the boat was Pilar of Key West. The name came from a shrine and feria in Saragossa, Spain that celebrates Nuestra Señora del Pilar - Our Lady of the Pillar. A feria is an annual feast that takes place in southern France and Spain, which features bull-fighting. Pilar had been a secret nickname that Pauline and Ernest had used for her when they began their adulterous affair in 1926. Hemingway also pointed out later that if he had ever had a daughter [he had three sons], he would have called her Pilar. In his 1940 novel about the Spanish Civil War, For Whom The Bell Tolls, Hemingway includes a character called Pilar: she is the part-gypsy partner of Pablo, the leader of the guerrilla band that Robert Jordan teams up with in the mountains. She is an admirable character - an earth-mother type, who serves as the steadfast centre of the guerrilla camp. 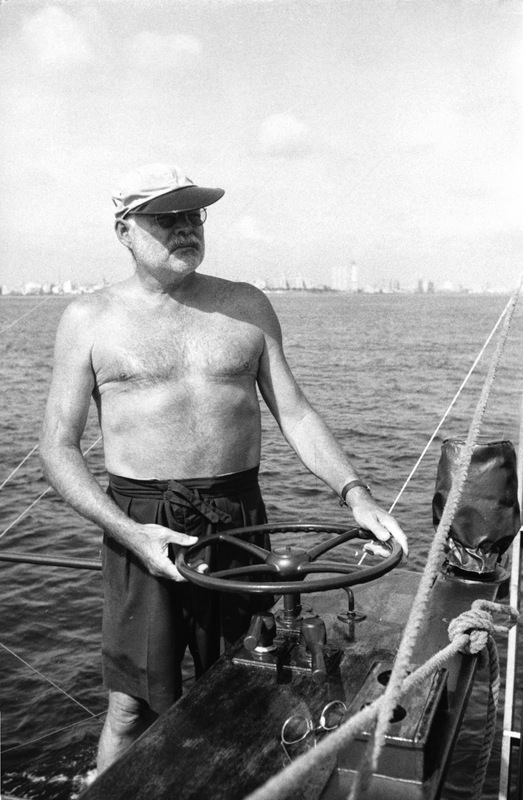 It took about five weeks for Hemingway to get his boat. When it was finished, employees of the Wheeler Shipyard sailed Pilar down to Miami. Hemingway met them there, paid off the balance he owed of about $4,500, and then piloted the boat down to Key West - arriving on May 12, 1934. Generally, Pilar was docked in the Key West harbour - just a ten-minute walk away from his house on Whitehead Street. 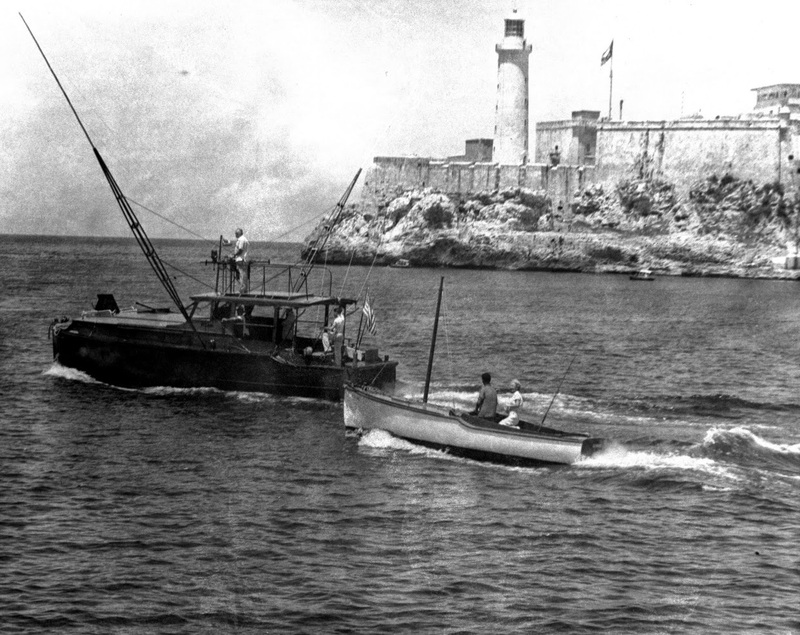 Hemingway made his first crossing to Cuba with the Pilar on July 19, 1934. It's about 90 miles due south of Key West. Travelling at an average speed of 10 knots, Pilar could get to Havana in about a day's sailing. But, on that first trip down, the water pump to the main engine broke about three miles off the Cuban coast, and the Chrysler Crown motor began to overheat. Hemingway switched to the much slower trolling motor - taking two hours to cover a stretch that normally would have lasted twenty minutes. 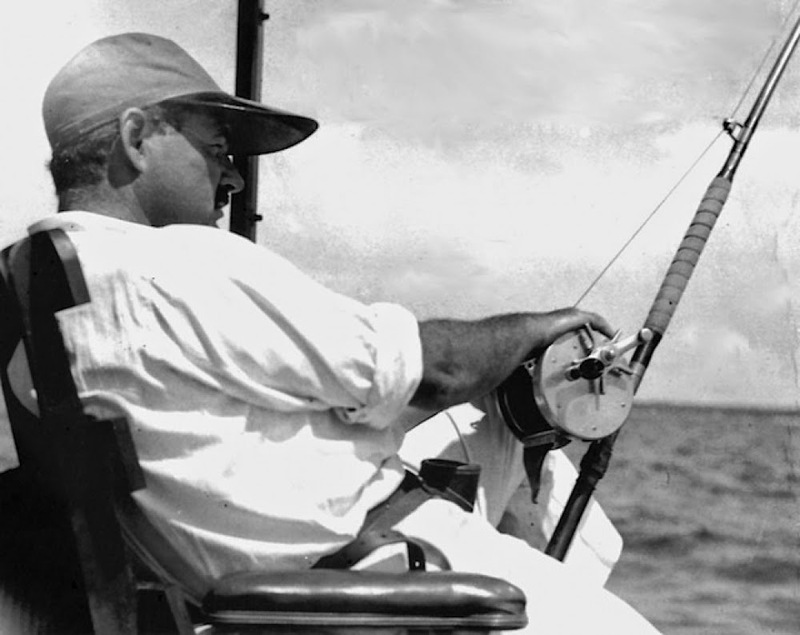 During the first few years of his adventures with the Pilar, Hemingway did most of his deep-sea fishing in Bimini (a small collection of islands on the western edge of the Bahamas). He lived in Bimini from mid-April to mid-August 1935, and spent a lot of time there during the fishing seasons of '36 and '37. In those years, Hemingway wasn't focused exclusively on marlin. He fished a wide variety of other species: swordfish, tuna, sailfish, kingfish, snook, tarpon, wahoos, barracuda, bonito, mako shark, etc. He developed a special interest in the blue-fin tuna, and is reputed to be the first angler to land whole and clean one of these huge tunas - all previous attempts, apparently, failed because sharks would attack and mutilate the fish after they had been snagged on the hook. 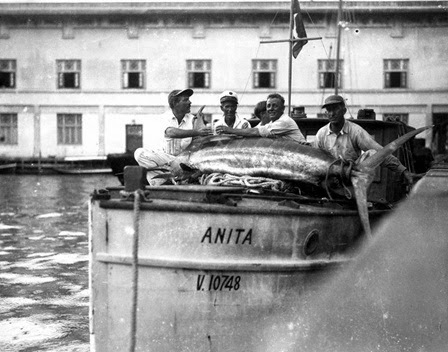 Hemingway's specimen was 381 pounds, and it took him 70 minutes to tire it, pull it in, and hoist it onto his boat - across a large wooden roller onto the specially-designed low-cut stern. In his book Hemingway's Boat Paul Hendrickson gives a detailed description of Pilar (pages 138-141). It was 38 feet long and had a 12 feet beam (its width at the broadest point). The cabin sides and deck were built of Canadian fir and Honduran mahogany. The cockpit at the rear of the boat could fit seven or eight people quite comfortably; there were two long cushioned bunks for lounging on, and small seats could be added during meals. A small table was stowed a few feet behind the wheel; it would be fixed on two outer legs. In the middle of the rear deck was the "fighting chair". It had a ladder-styled slat-back and leather-cushioned arm rests. This chair was bolted firmly to the deck and rotated 360°. Pilar could hold six people in the sleeping compartments and two more in the open-air cockpit (which featured roll-down canvas sides and copper screens, to help keep away the bugs at night). Access to the sleeping compartment, forward of the cockpit, was through a half door and companionway. There were upper and lower berths, a tight toilet and a cubbyhole galley for fixing meals. Loaded for a cruise, Pilar had a compartment that held 2,400 pounds of ice, in order to cool fresh fruits and vegetables - the avocadoes and mangos, for example - and preserve the captured fish over many days. The ice was also important to cool the beer and wine, and to add to the many daiquiris and mojitos! Hemingway also stored 100 gallons of drinking water. Although it could cruise easily at 16 knots, Hemingway usually sailed Pilar at 10 knots, in order to save gas. The boat had a 300-gallon capacity fuel tank. But he could store another 100 gallons in portable drums that fit in a forward compartment. If he was busy fishing, rather than covering a long distance, Hemingway would switch to the Lycoming trolling motor - he could troll all day with that motor, and only eat up 10 gallons of fuel. Pilar was an impressive sight on the water. It rode low and long, with a shiny black hull and a handsome green canvas roof and topside. When Hemingway sailed her out of harbour (Havana or Cojimar) in the early mornings, he liked to stand on the top deck - the flying bridge. This flying bridge was added in 1937. It had a second set of duplicate controls for the engines - throttles and levers which came up over the cockpit via several metal pipes. When he wasn't up on the flying bridge - which gave him a better view of the surrounding waters - he was usually at the helm, on the port-side of the cockpit, or taking a nap on one of the cushioned benches. The helm consisted of a lighted binnacle, which held a compass, a wheel and various engine controls. 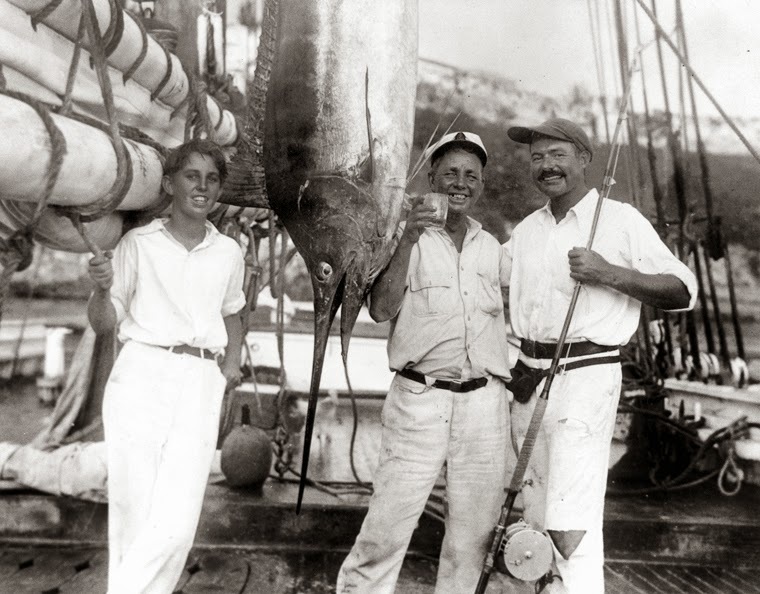 Fishing from the Pilar for marlin became Hemingway's main hobby and recreation. Once he had discovered the thrill of fishing for these giant fish - they could be anywhere between 50-1200 pounds in size - nothing else would do. He also loved to share the sport with others; and, over the 27 years he had Pilar, he welcomed hundreds of people onto his boat - sharing his knowledge and enthusiasm, and tutoring neophytes in the basics of deep-sea angling. To get a sense of what it was like to fight one of these giant marlins, read Hemingway's epic thirty-page account of such a struggle in the "Bimini" section of his posthumous novel Islands in the Stream (1970). 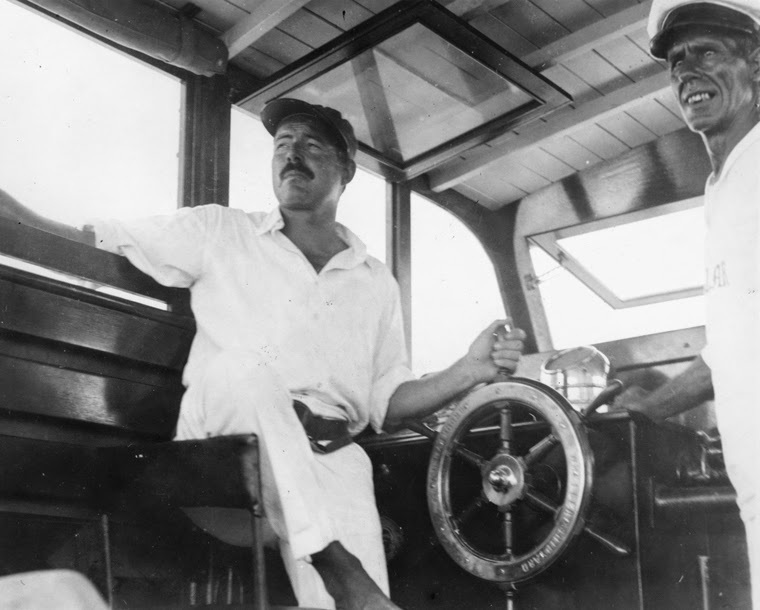 Hemingway usually had a "first mate" with him on board - to help with the sailing, but also to serve as a general factotum: fixing drinks, cooking meals, and providing company. The first man to play this role was Carlos Gutiérrez - a commercial smack-fishing captain in his fifties. Hemingway had met this Cuban fisherman back in April, 1932 during the two-month marathon of marlin-fishing he had undertaken with Charles Thompson and Bud White. He had been much impressed - and hired him initially to serve as first mate for the rest of that first summer with Pilar (1934). Guitiérrez was replaced in 1938 by another experienced Cuban - Gregorio Fuentes. This native Canary Islander - then 41 years old - would work loyally as first mate for Hemingway for the rest of Hemingway's time in Cuba (until 1961). He died in 2002, at the age of 104. 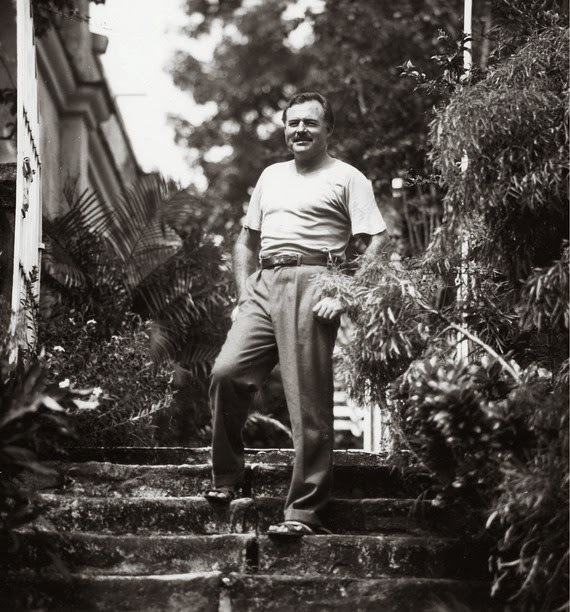 After Hemingway's death in 1961, Fuentes often claimed that he had been bequeathed Pilar. This was confirmed by Mary Welsh Hemingway, the author's fourth and final wife: she wrote in August 1961, just two months after Ernest's suicide, that Hemingway had left her instructions - in a letter that accompanied the will - to give Pilar to Fuentes. But, as Hendrickson points out, this conflicts with a letter she wrote in February, 1964, in which she said: "We are letting Pilar rot away in Cuba because I know Papa couldn't bear the thought of anyone else being her commander". And, then, in her autobiographical book about her life with Ernest, How It Was, she says she came back to their Cuban home, Finca Vigia, and told Fuentes to "take her [Pilar] out and sink her in the current [the Gulf Stream]." That, of course, didn't happen. She then claims that "the Cubans used Pilar as a workboat for a while, and then installed her (poor thing) as an exhibit on the Finca lawn, so I was told." In 2005 someone showed author Paul Hendrickson a two-page document which said that Fuentes had kept Pilar in the harbour at Cojimar, until he decided to give it to the government. It was moved from the fishing village (Gregorio's home) up to Finca Vigia, to serve - apart from the house itself - as the museum's main exhibit. My new 'Hemingway friends' - Richard and Brenda - and I reached Finca Vigia at 10 a.m. on March 13, 2014. The place is now known as Museo Hemingway. It is perched on the top of a hill in a suburb of Havana called San Francisco de Paula. Back in Hemingway's time it was way out in the country, about nine miles south of the capital; now it is part of the sprawling, suburban shantytown radiating out from the densely-populated city. After paying our entrance fee, we got back in the taxi and it delivered us up the sloping hill to the parking lot next to the souvenir shop. We walked over to the house. Everything was as I remembered it, but there were a lot more people about than on my previous visit. The sun was out - which was a relief; it had been threatening to rain all morning. I wanted good light for my photographs. One result of the impending downfall was that the staff at the museum had closed up all the doors and windows. Even though entry into the house is forbidden, they normally have most of the doors and windows wide open, so that you can lean into the building and take as many photographs as you wish. Today, I had to wait for a couple of understanding guards to open a window here, and a door there, for a minute or two, whilst I quickly snapped some photos of the interior. This wasn't too disappointing for me because I got plenty of good pictures of the house on my previous visit in 2010. At the back of the house, just off its north-west corner, sits a three-storey tower. It was built for Hemingway by his fourth wife, Mary Welsh; she intended it as a quiet retreat, where Ernest could do his daily writing in the morning and early afternoon. Hemingway didn't like the too-solitary feel of the place. 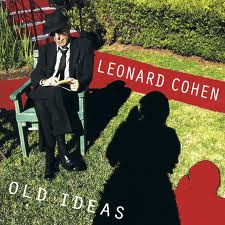 He preferred to write in his bedroom - standing up at his typewriter. The tower was abandoned primarily to the large crowd of cats that roamed the property. It was from the landing at the top of the tower stairs that I got my first glimpse of the swimming pool and boat through the trees to the west. They lay about 100 metres from the house. We walked in their direction via a long path of paving stones - the path edged by a thin, intermittent curtain of bamboo. The old-fashioned, concrete, in-ground pool is huge. It was empty of water, coated with pale-blue paint. It looked to be about 10-12 high at the deep-end. On either corner of the pool - at the shallow end - are a couple of outhouses; these, presumably were his-and-hers changing rooms for visiting guests. Ava Gardner didn't bother - she swam naked alone in the pool during one of her visits to Finca Vigia in the 1950s. The Pilar rests perched on sets of concrete blocks just a little way beyond the pool. It sits where the tennis court used to be. There is a large corrugated plastic roof about twenty feet above the boat, protecting it primarily from the glaring mid-day sun. It is like a huge carport, open to the wind and rain. The boat has lost all of its varnished, shiny glory. It is coated in grime and the brass and copper fittings are corroded and slowly turning green. Do they provide occasional renovation to the boat? I don't know. When I was there, it certainly looked in need of some tender loving care. On the southern side of the boat, between it and the pool, are a row of four small tombstones; they mark the graves of some of Hemingway's favourite pets - including Black, a stray dog he adopted in the U.S., and brought back to Cuba. Back at the house, I got some more photographs looking at the house and tower from the grounds on the southern side of the property. Richard and Brenda walked over to the souvenir shop. I hung around near the front door. I wanted to get some good shots of the entry into the house - which I had failed to get on my previous visit. I set my tripod up and waited. I got some good shots of a small group of women clustered tightly on the threshold. Then a few of me standing alone, ringing the large "doorbell". I yanked on the rope, thinking: For whom the bell tolls; for me and thee. Then as I vacated the steps in front of the house, one of the many neighbourhood dogs that roam the place came over and dropped comfortably there, near the entrance, as though he owned the place. ... it tolls for thee - and me! Hemingway fans visiting the Havana-area of Cuba for the first time must visit Finca Vigia. It really is inspiring. For more about the house - including some good shots of the interior, check out my previous blog post from February, 2012. Hemingway enthusiasts might also consider checking out my photo essay about Hemingway's life in Paris in the 20s, published in October, 2013. Resources: Most of the technical details about Pilar come from Paul Hendrickson's excellent book Hemingway's Boat: Everything He Loved in Life, and Lost, 1934-1961 (published in 2012); other background on Finca Vigia from Hemingway: The Final Years, the fifth volume of Michael Reynolds superb biography; the book by Mary Welsh Hemingway (his fourth wife) is How It Was (published in 1976). Great job, Clive...I love the pics, especially the vintage ones...Keep 'em coming!